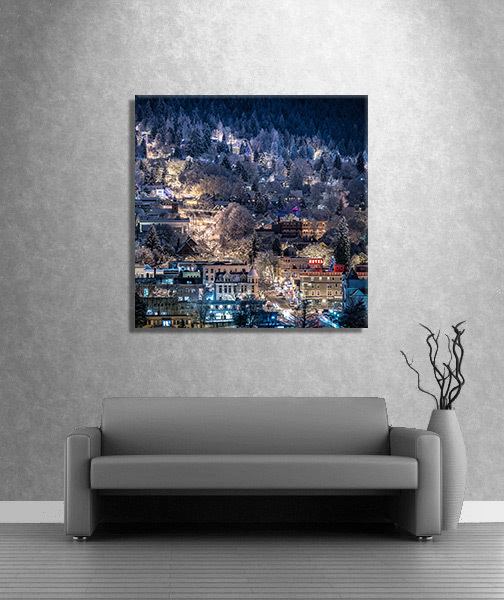 Please use this page to select your canvas size and to place your order. Your choice of image will be verified by email and is not reflected in this product image. High quality, North American made, 380 gsm premium artist quality, water resistant matte poly/cotton blend canvas material with fine texture. Canvas gallery wraps are available in two different thicknesses, 3/4″ (thin gallery) and 1 3/4″ (thick gallery). Photos are printed using a 12-color photo ink configuration which provide a very large color gamut, seamless gradations, bright and rich colors. Heavy duty hanging wire assembly for canvas wraps larger than 16 x 20 and sawtooth hangers for smaller sizes. Scratch resistant matte or low luster UV film which protects your image from fading, atmospheric pollutants, dirt, dust and scuff marks. Designed to protect your prints up to 200 years! Each canvas print is either shrink wrapped with corner protectors or wrapped in bubble wrap depending on the size of the print and the level of damage protection required.